BANGKOK, Thailand (CNN) -- A lumbering grey shadow can often catch your eye as you drive along one of Bangkok's most polluted and congested streets, Sukhumvit. 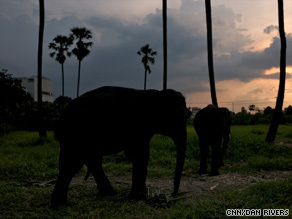 A new plan aims to return street elephants to the wild by paying owners for the animals. If this were not Bangkok, you would think you'd had one too many beer Singhas, but in this city of contradictions, anything seems, and often is, possible. And so it is that spotting a huge elephant, dodging the tuk-tuk motorcycle rickshaws, the ubiquitous taxis and blizzard of traffic is nothing out of the ordinary. I remember seeing my first elephant just outside the front gates of our home here -- and standing in wonderment -- it seemed magical and slightly surreal. I stood and the elephant owner insisted I gave him a dollar -- which I did, just to have the chance to feed this huge creature and stroke its rough, scaly trunk. But I was naive, like so many tourists and newcomers here, as to the cruelty involved in this "elephant begging." Over the next three years, I started to notice more and more elephants and see how some seemed distressed; shaking their massive heads from side to side, their eyelash-framed eyes wide with concern and bloodshot. I wondered why it was allowed and why the government did not do something about it. But then talking to friends and colleagues here I soon realized that this was a problem that successive governors had tried and failed to tackle -- perhaps running up against vested interests and unscrupulous businessmen, who invest in elephants like they would a good stock or a race-horse. The elephants were often run by criminal gangs and could bring in a healthy $30 per animal per day I was told -- not bad money in Thailand. But now, authorities say elephant begging is going to be phased out with a mixture of financial inducements and tougher fines. It is already against the law to bring these animals into the city, but that rarely seems to be enforced here, and even if it is, the fine is so small the elephant owners can easily afford to pay it and shrug it off. Under the new regime, elephants will be sold to the foundation, which in turn will be able to release them back into the world. Apparently, elephants are one of the few animals that can easily adapt to life without humans, even when they have been born into captivity and are domesticated. It all sounds brilliant. But I have lived here long enough to know these well-intentioned schemes have a habit of withering into failure. With more than 100 elephants on the streets of Bangkok, I doubt whether all of these majestic animals will be back in a real jungle rather than one rendered from concrete, anytime soon.